The "trees" are from a retired set called Funky Four, stamped in Mint Macaron, and the sentiment is from A Dozen Thoughts, stamped in Chocolate Chip. I added a bit of twine for a little interest. This is a notecard-sized card; the diecut is SU's Greetings thinlet, and I punched out some random hearts and added some candy dots for fun! Thanks for visiting today! Well, yesterday I shared that Cassidy lost her first tooth. Yesterday morning, around 6am, she woke up to find the tooth fairy had visited her....she was SO excited that she decided to try to pull out her other one....and she was successful! I wish I could remember if I ever pulled out any of my own teeth....I am pretty sure I didn't! I think my dad probably did it! How about you? Any scary/funny tooth-pulling stories?! I'd love to hear them! Love that first card LeAnne - CAS perfection and the second one is so sweet! As for tooth-pulling stories, the best one is probably that I have an irrational fear of wobbly teeth, bordering on phobia - which my kids think is hilarious!! Me - not so much! Glad to see the tooth fairy is working overtime to keep up at your house at the moment! how funny about Cassidy pulling her second tooth out! 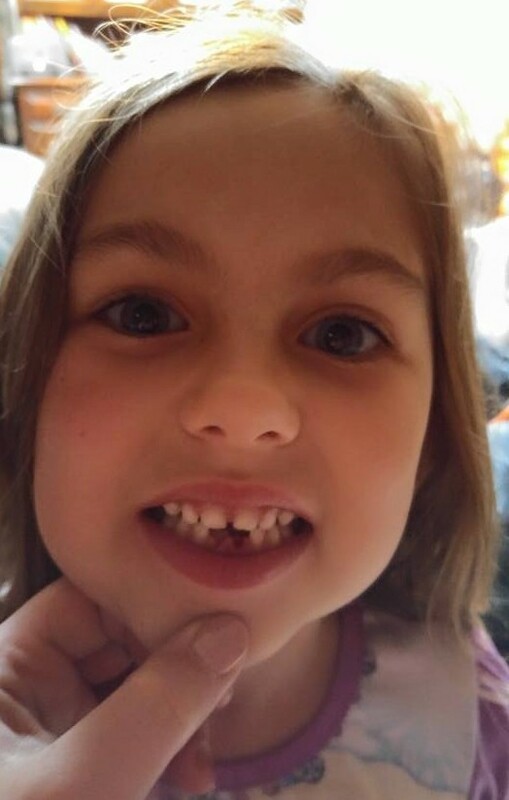 Sounds like the Tooth Fairy was a little too generous! My daughter would go to her Grandma's to have her tooth pulled. My mother would say, "Let me see that tooth" and with a Kleenex over the tooth she would pull it. It became a ritual from then on. Love your cards, so cheerful and colorful. Oh how darling ... LOve your papers, LeAnne, especially those bright and cheerful ones with orange! My only tooth story is accidentally swallowing one at the movie, with a Milk Dud! Gross, right?! Love both of these cards, LeAnne! Love both the layouts and the colors. I think I can remember pulling out one of my teeth, lol! Loving your paper choices and design !! Great designs...I remember wiggling my teeth, but never pulling them! Thanks for sharing at Less is More! Great cards, LeAnne! I always loved that little stamp you used on the first one, so cute peeking over the pretty DSPs you chose. I love the second one too, the panel of hearts is adorable. Funny story about Cassidy's tooth! I had to chuckle when I read it because that is exactly what our middle child did when he lost his first tooth. And 30 years ago all he got was a quarter. I've heard that the tooth fairy has gotten much richer these days…. CUTE cards LeAnne! Love the simplicity of the first on and the mix of patterns on the second. Way to go Cassidy!! Our son started crying while eating because he thought he had swallowed his tooth. We finally got him calmed down so that he could finish his dinner. Before biting back into his hamburger, he saw his tooth sticking in it LOL!! Two beautiful cards! You've used lovely papers and the results are so pretty. Great LIM card - well done! Super design LeAnne, great stamping and great use of DP! Really classy card with the horizontal panel, love those colours too. These are both really cute! !